Written by 4/3/2008Share this story on Facebook! Thank You -- We Did It! Soaring past its $115 million goal, the College raised $145 million from 37,000 alumni, parents, and friends. The benefits of this fundraising are already visible around campus, starting with the new School of Business building, which opened for classes in January. The campaign also generated 144 scholarships and endowed funds, secured apartments for students, funded a new Center for Faculty Research and Development, and more. Construction of the next exciting addition to campus -- a 130,000 sq. 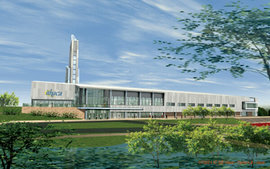 ft. athletics and events center with lighted outdoor turf field and aquatics center -- is scheduled to begin this summer.